I love January in South Africa. It’s no secret that we have some of the World’s best fruit here and in January fruit is available in abundance. Stunning, juicy nectarines and peaches, sugar-sweet watermelon and the most delicious berries. I try to take full advantage of berry season and I buy copious amounts of it when I can. I use it to jazz up ice cream, to add prettiness to lemonade or iced tea and to wow in delectable desserts like this one. 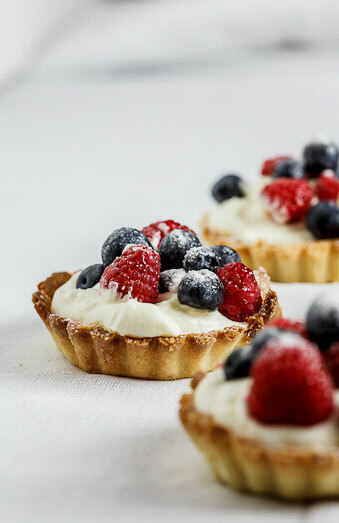 I made these tarts using my favourite pastry recipe to date. I just played around with the ratios and found a pastry that I will from now on use whenever I need shortcrust. I used a touch of lemon zest, a little vanilla and icing sugar to sweeten the pastry and this resulted in a pastry so light, it tasted like a delicate sugar cookie. 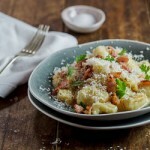 Making this in my fabulous Kitchen Aid food processor made this too easy for words. It literally took me 5 minutes to knock this pastry together. 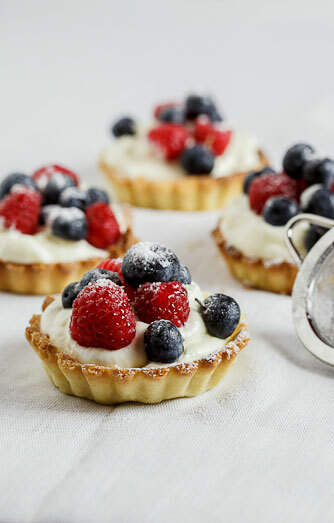 The filling is a simple white chocolate cream made by whisking melted white chocolate into soft whipped cream. Top with jewel-like fruits and a dusting of icing sugar and you have a dessert straight from the food gods. To make the pastry, place all the ingredients except for the egg yolk and ice water in the bowl of a food processor and pulse until the mixture resembles rough breadcrumbs. Add the egg yolk and pulse again. Now add the water, tablespoon by tablespoon, whilst mixing, until the dough comes together in a ball. Remove the dough from the food processor and wrap in clingwrap. Place in the fridge to cool for at least 30 minutes. Remove the cold dough from the fridge and roll out. Cut into circles big enough to fit your tart cases, press into the cases and return to the fridge for at least 30 minutes. When you are ready to bake them, pre-heat the oven to 180°c and blind bake (line pastry with baking paper and fill with beans) for 7-10 minutes. Remove the baking paper and beans and bake for another 5 minutes. 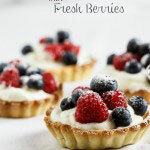 Remove the tart shells from the oven and allow to cool. To make the filling, whip the cream until soft peaks form. Slowly, while whisking, add the melted white chocolate and whisk until the cream is thick and glossy. 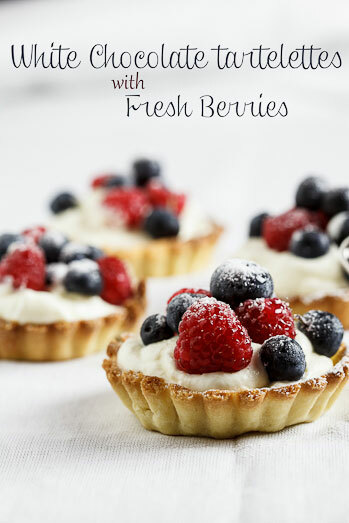 Place a spoonful of the white chocolate cream in each tart shell and top with fresh berries. 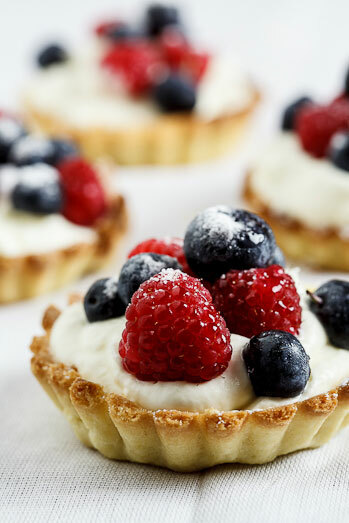 I used my new Kitchen Aid food processor to make these tartlettes. 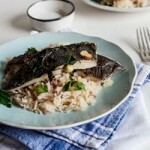 The food processor is available from TAKEALOT.com. This is not a sponsored post but TAKEALOT were incredibly generous and sent me the processor. These look so amazing! What size tart cases did you use? Kelsey, they were approx 5cm in diameter.